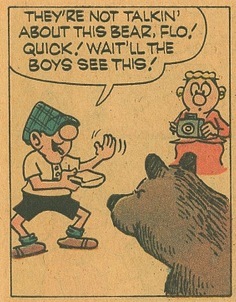 Andy Capp Goes To Camp! Here is a quick summer time update for all you Rotten Ink readers. Growing up, I used to love to eat junk food from time to time, and one of my weakness when it comes to this style of “food” is potato chips and other snacks like them. I can remember eating Mike-Sell’s chips while watching USA Saturday Nightmares and enjoying every bite. But I also have many great memories of watching WWF Wrestling or reading a Marvel comic while munching on some Andy Capp Hot Fries, and with that, this update will be about a comic based on Andy Capp. 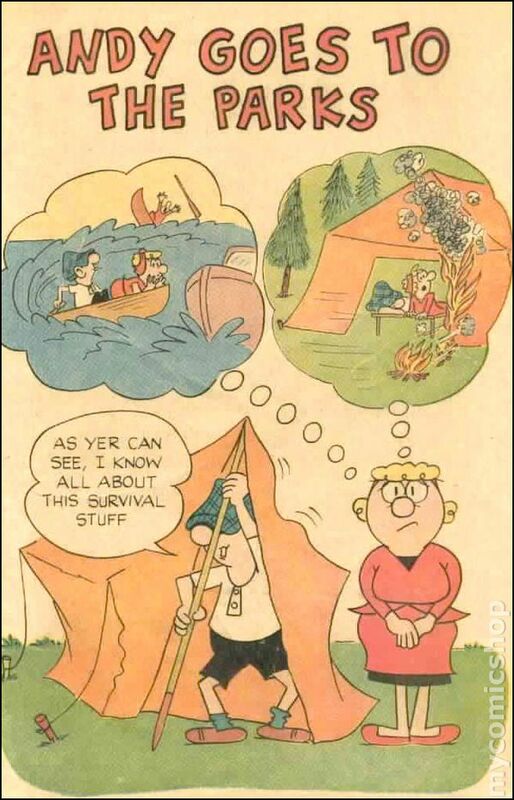 While he didn’t have a full comic series based around him, he did have a comic that helped teach people about the do’s and don’ts of camping at a National Park! So let’s get ready to talk about snack food and the great outdoors! When it comes to Andy Capp Fries, I can safely say that I am a fan of this corn based snack and have eaten many bags in my life time thus far. In fact, for the longest time when it came to junk food all my brother and I wanted to eat was hot fries. In late 2014, my dad even teased me about it, saying every time they went grocery shopping I would ask them to get me a bag of fries! To this day I get craving for them and will snack on them at work and very rarely at home. 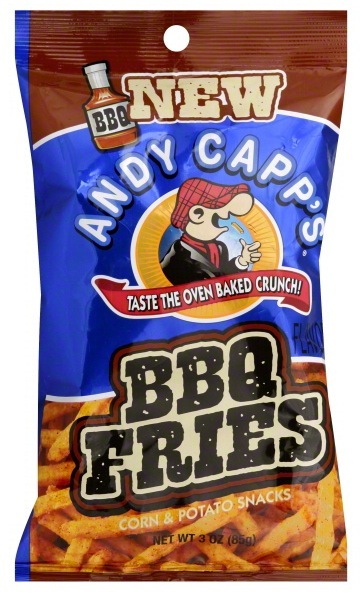 Andy Capp Fries come in many different flavors from the classic hot all the way to BBQ, and the best part about them is the very cheap price tag for a bag. 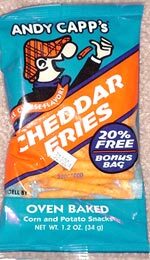 The company that made this snack was Goodmark Foods Inc in 1971, and they licensed the character to make the snack based around him and would feature a comic strip of the character on the back of the package. But in 1998 ConAgra Foods bought out Goodmark and is now the company releasing the tasty snack to your local stores. 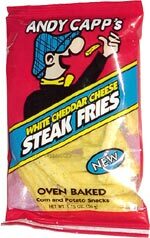 The downside to ConAgra being the parent company to Andy Capp Fries is that it’s a company that’s been surrounded in negative vibes and press from things such as environmental issues from the factories. In 2004 five workers lost their lives when a shooter entered the Kanas City plant; they got caught weighing down grain with water to make more profit from buyers. They tore down historic structures to build plants, and they have even had outbreaks of sickness from some of their products…so yeah, they are not that good of a company. But man are the Andy Capp Fries so good! These are the flavors I like in order Hot Fries, Cheese Fries, Hot Chili Cheese Steak Fries, White Cheddar Steak Fries, Salsa Fries and in last, BBQ Fries. So let’s all go get a bag of Hot Fries and enjoy the goodness that is this cheaply made snack. 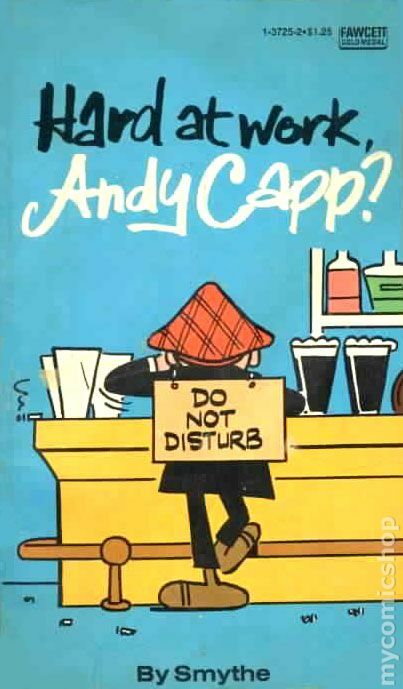 For those of you who don’t know who Andy Capp is, let me take this moment to introduce him to you. 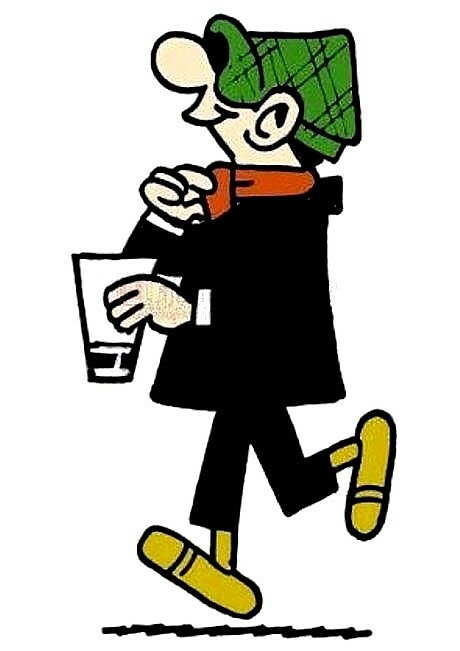 Andy Capp is a comic character created by Reg Smythe who is an unemployed/slacker bloke who lives in Hartlepool and spends most of his days at the pub drinking as well as playing darts, pigeon racing and football. Andy loves to sleep on the sofa and also puts a lot of stress on his wife who works and pays the bills as well as takes his threats of abuse if she doesn’t do what he wants her to do. Most of the time things don’t go well for Andy, and he ends up getting hurt in the likes of the football games he plays. 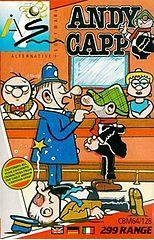 Andy Capp is known for his flat cap and his black jacket and slacks, the hat always blocks his face never giving the readers a chance to see his appearance. He speaks with a thick English accent and loves to drink and can be seen with a glass of beer or booze most of the time. 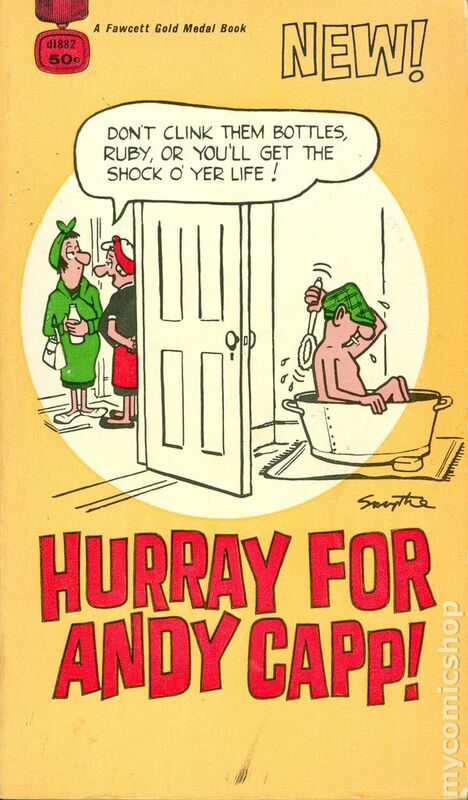 Love him or hate him, Andy Capp is who he is and he doesn’t care if you like him or not! How I first came to know about Mr. Capp was via the Sunday Funnies in the Dayton Daily News. While he was not my favorite comic strip as that honor at the time would have went to Peanuts or Garfield, it was still one I enjoyed reading. I can also remember cutting out Andy Capp himself from the paper and feeding him to our bird Roxanne just like I did to Freddy via the Freddy’s Dead ad (for those who remember I spoke about that in my update for Innovasion’s Freddy’s Dead movie adaptation series in the update called “ Was Freddy Really Dead?”). Around this time I was also picking up old paperback versions of Andy Capp that collected the comic strips. I would get them from garage sales, The Paperback Rack and Half Price Books. 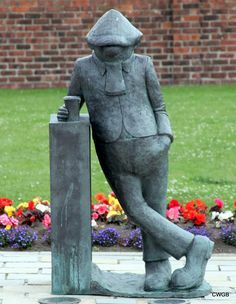 One very cool thing that I should also point out is that in Hartlepool, England in 2007 a cool statue was made to honor Andy Capp and was placed for tourist and townspeople to visit. So think about that, in England a statue for a character who’s a lazy bum and mistreats his wife is on display for the world to see. 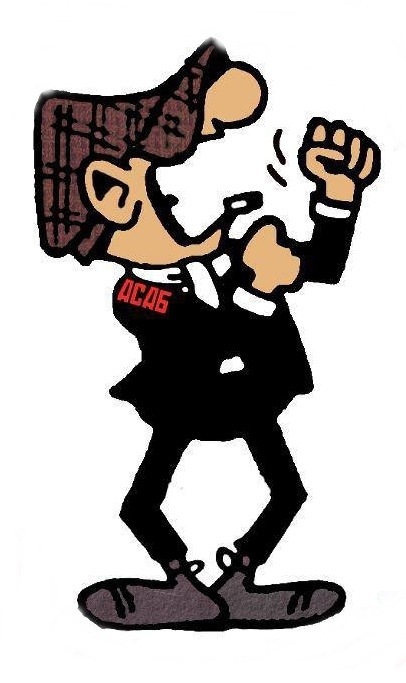 I for one can stand by this cause; while the character does do some bad things, he still is iconic and a staple for Sunday newspapers around the world. So if you’re ever in Hartlepool, make sure to visit Andy Capp….and bring him a beer if you remember. One other thing I should mention is that Andy Capp had a video game for the Commodore 64 that was released in 1987 and was made by Blitter Animations. The game was released on Christmas and was thought to be a huge seller for the company, and has Andy Capp having to find money to give to his wife after he spent his unemploment check on booze. One goal of the game is to not get arrested after you fight a cop or punch your wife! The game was praised by fans of the comic strip, and if you have a C64 maybe you should check it out…sadly I have not played this game. So now that our fingers are stained red from the powder of the Hot Fries and the heat of the summer sun is shining down on us, I think it’s time for us to go to the park with the one and only Andy Capp and see what kind of outdoor adventures we can have. I should also note that I voted that we visit John Candy at Camp Candy like we did last year but Andy vetoed that idea! I want to thank my pal Jason Young and his mom for getting me this comic to review and I must remind everyone that I grade these on a standard 1-4 star rating and base it on how well the comic stays to the source material, its entertainment value and its art and story. So get that backpack on and get ready to hit the trail with Flo and Andy. 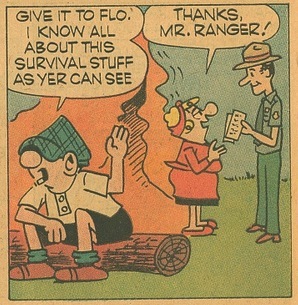 Flo and Andy Capp are on vacation, and they are staying in a National Park. This is not what Andy wanted to do because there are no pubs for him to drink at. When a Park Ranger comes by to offer them tips, Andy doesn’t wanna hear it and the Ranger leaves some information with Flo on what to do and not do while in the woods. Andy Capp does not listen to the rules and is attacked by a bear after feeding it, is swept away in a current when swimming in the stream and even sets his own tent on fire when starting a fire too close! The next day Andy leaves Flo to clean up the site as he goes to town and rents a trailer and stocks up on beer gearing up for fishing, and, being Andy, he overweighs the boat and sinks it! He also almost smothers them by having a heater lit in the trailer with no ventilation. To blow off steam Andy goes for a hike in the wrong shoes and his feet swell as he is also bitten by a raccoon! Andy Capp and Flo end the vacation, and while Flo had a good time Andy didn’t but could have if only he would have listened and followed the rules of camping. What a fun silly free comic giveaway that I am sure added to many kids’ fun time at the parks where this was given away. The story of this comic is Andy Capp won’t listen to the Park Ranger and the rules of the park and keeps finding himself in trouble. All the while his wife Flo is trying her best to get him to listen and follow the rules. Andy Capp comes off as ego driven as ever and clearly has the he knows more then you do attitude. Andy also mistreats his wife even threatening to punch her at one point and is lazy and worries more about booze than spending time with nature. Flo just goes with the flow and tries her best to have Andy listen to what the Ranger has said, and also seems to get joy when something bad happens to her husband when he doesn’t. The Park Ranger is the voice of reason and an over all nice man who loves his job, and if not for him Andy could have died several times! 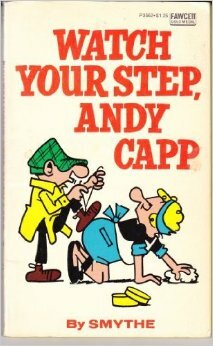 If you’re going camping this summer, I hope you will not be an Andy Capp and will follow the rules of the parks and nature in general and not wind up with swollen feet and multiple animal bites. I have wanted to cover Andy Capp on Rotten Ink for sometime now and am glad I finally got the chance to do so in this quick summer time update! But next update we are walking away from the lazy bum Capp and taking a look at some really hot b-movie actresses from Alternative Cinema and some comics based on the films they made. So make sure to come back for that one. Until then, go out and find a nice tree to sit under and read a comic or two.